Our family is crazy about sourdough, so crazy in fact you could say they are gaga over it! I bet out of all of my store bought bread purchases at least 75% are of the sourdough variety. There’s plain, cracked wheat, rosemary or garlic, sliced or baguette style, English muffins or whole rounds used as bowls for clam chowder, toasted for breakfast, used for sandwiches, spread with garlic butter and grilled… the uses of sourdough bread are practically infinite. 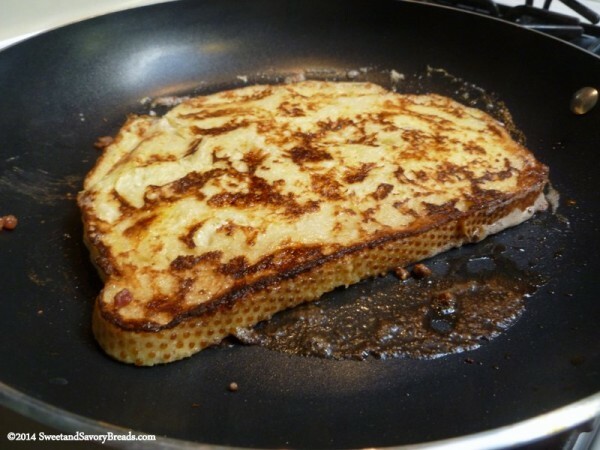 We almost always have it on hand in our house so I began using it for French toast years and years ago but I have personally never known anyone else who does this. When I have prepared this version for overnight guests I have gotten more than a few quizzical looks and outright skeptical exclamations of “sourdough French toast?? ?” I could almost hear the “ewwwwww” in their brains but if you think about it, you have toast, eggs and milk. Made separately it’s your average breakfast right? That little sourdough tang just adds interest not found in your average egg and milk soaked white bread. After trying my version without exception the reviews were always a big thumbs up. Recently I purchased a large bag of real bacon bits at my local store and one morning while making my usual French toast I had an epiphany. Why not sprinkle my bread with the bacon?? Why not indeed? The world seems to be going crazy over bacon lately so why not jump on the bandwagon? The results were, dare I say, inspired! With the addition of butter and syrup I think you’ll agree that this is one of the best combinations of sweet and savory. 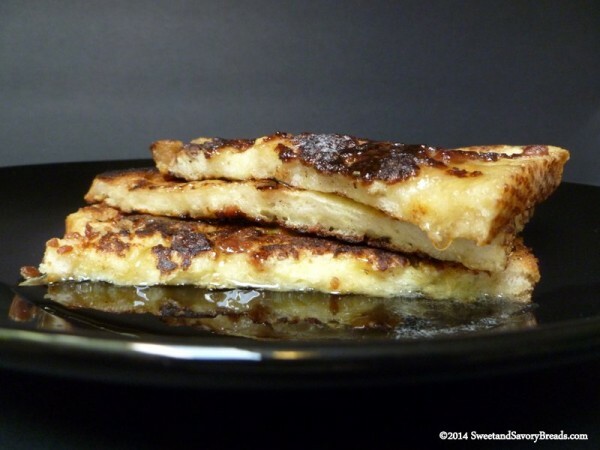 Not your your typical french toast. This one is made with sourdough bread and everyone's favorite BACON! 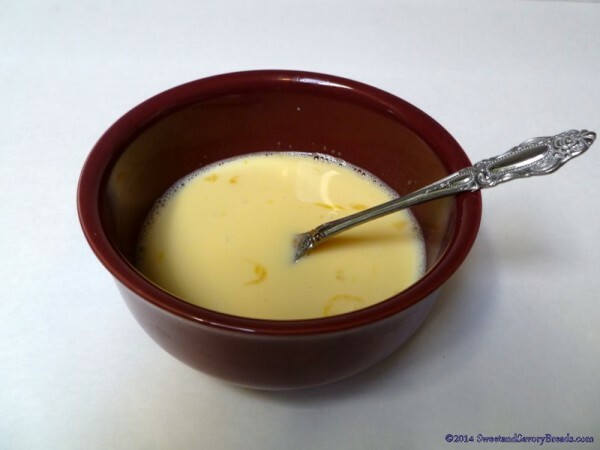 In a medium bowl whisk eggs and milk together. For ease of dipping, transfer the egg and milk mixture to a any flat pan with a lip such as a dinner plate, pie plate or casserole dish, making sure the pan or plate is big enough for your bread. Heat a large skillet or griddle to medium heat and spray with non-stick spray. You may also grease the pan with a small amount of butter or oil. 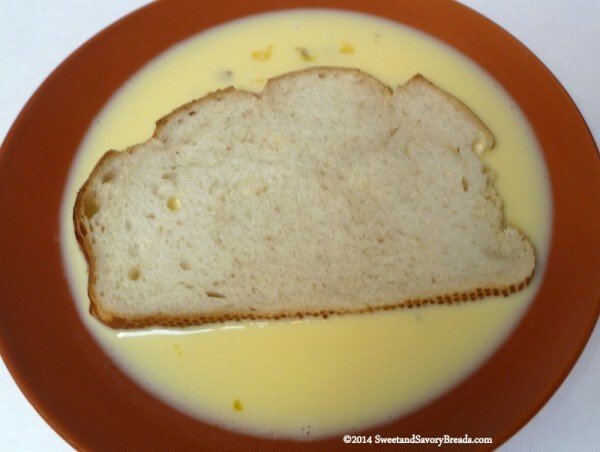 Dip one slice of bread into the egg and milk mixture then turn over to wet the other side. Transfer the bread slice to your skillet and allow to cook approximately 4 minutes. While the first side is cooking, sprinkle 2 Tablespoons of real bacon bits on the wet side of the bread pressing down lightly to stick. Spoon a little extra egg on in a spot or two and spread around if needed. If using a smaller bread, allow 1 Tablespoon of bacon bits per slice. After 4 minutes lift the edge to check the first side to see if the egg has set. Using a spatula carefully lift the bread and turn over keeping the bacon bits underneath the raw side. If any wayward bits escape pick them up and put on the top or push them back under. Allow another 4 minutes of cooking time to finish then remove the slice to a plate or platter. Repeat with the remaining slice of bread. Cut the slices in half and serve with butter, powdered sugar or syrup if desired. 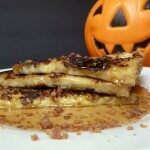 This sourdough bacon french toast recipe is easy to double, triple etc to accommodate your family's needs. If you use butter to grease your pan be sure to add your bread quickly because it browns fast. I recommend using only real bacon bits and not the jarred imitation type. 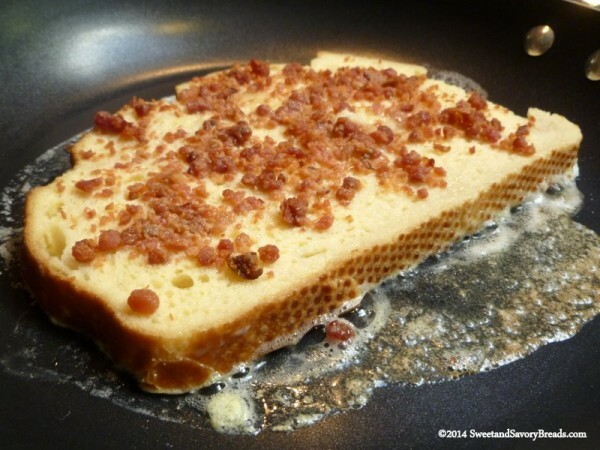 We hope you enjoy this recipe for Sourdough Bacon French Toast! 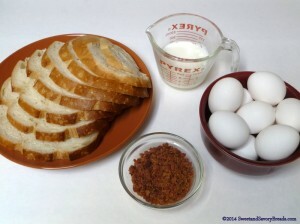 Posted in Breakfast BreadsTagged bacon, bread, breakfast, butter, eggs, french toast, savory, sourdoughBookmark the permalink.